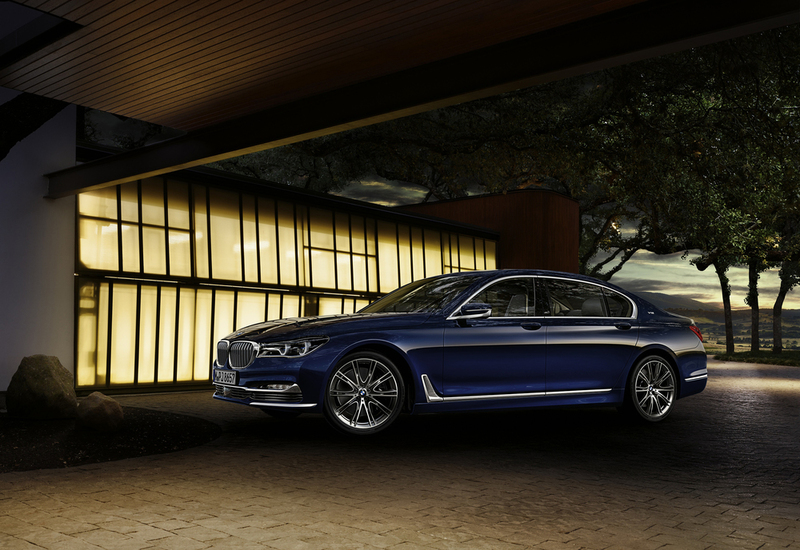 BMW has unveiled an all-new limited edition ‘THE NEXT 100 Years’ flagship 7 Series model. Built in partnership with watch-maker and pen manufacturer, Montblanc, the new model follows in the footsteps of BMW Individual models, and is based on the Individual M760Li xDrive V12. Featuring a variety of special, unique additions it will be produced at BMW’s Dingolfing plant, known for ‘uncompromising quality standards, traditional style consciousness, and handcrafted precision’. Finished in Centennial Blue, the limited edition model is powered by a M Performance V12 engine producing 610hp and 800Nm of torque. It’s harnessed by a highly ‘sophisticated chassis’ specifically tailored to the model, with Integral Active Steering as standard, and deployed to the road via BMW’s xDrive all-wheel-drive system with a rear-bias for more dynamic handling. 0-62mph takes just 3.7 seconds, on to a governed top speed of 155mph. It now also links up with the Auto Start-Stop function, which is just one measure that contributes to an official combined fuel consumption figure of 22.4mpg and CO2 emissions of 294g/km. With a focus on interior comfort, the special 7 Series features Full Merino leather in Smoke White and thanks to its soft, fine-grain surfaces the leather remains breathable and provides ‘supreme comfort’. Quilted seat surfaces in a woven look, hand-woven piping and contrasting seam applications display Dingolfing's precision and attention to detail, while floor covering and floor mats, safety belts and the BMW Individual headliner also come in Smoke White. The interior ambience of the centennial model is capped by BMW Individual interior strips in Piano Black Finish. The BMW Individual leather steering wheel with fine-wood applications is in the same finish. Montblanc and BMW teamed up to create a fountain pen that 'underscores the uniqueness' of the BMW Individual M760Li V12 THE NEXT 100 YEARS. The “Montblanc for BMW” Centennial Fountain Pen follows the principles of the Maison Montblanc in terms of quality, styling and constant innovation. For more than 110 years now, the name Montblanc has been synonymous with writing culture and top-class workmanship. In collaboration with BMW’s design department, Montblanc has now developed this unique fountain pen, which is limited to 100 pieces and handed to every owner of the new 7 Series. The Montblanc Meisterstück features BMW design elements from the new Individual series - the surface structure of the Meisterstück Skeleton Fountain Pen is reminiscent of the quilted seat surfaces in a woven look featured in the BMW 7 Series centennial model. Elements of the fountain pen come in the car’s exterior colour of Centennial Blue metallic. The ‘rhodium-plated, Au750 gold’ Montblanc nib bears an engraving of the unique backstitching also found on the Merino leather seats. Other standard features include Head-Up Display, Surround-view, a Sky Lounge Panoramic glass sunroof, front and rear Active seat ventilation, Heat Comfort package and a Bowers & Wilkins Diamond surround sound system. Ambient Lighting, Welcome Light Carpet, and an 'Executive Lounge' package are also standard. The removable 7 inch tablet controls the infotainment and comfort functions available in the rear compartment and can also be used to play back external audio and video files, as a games console or to surf the Internet. 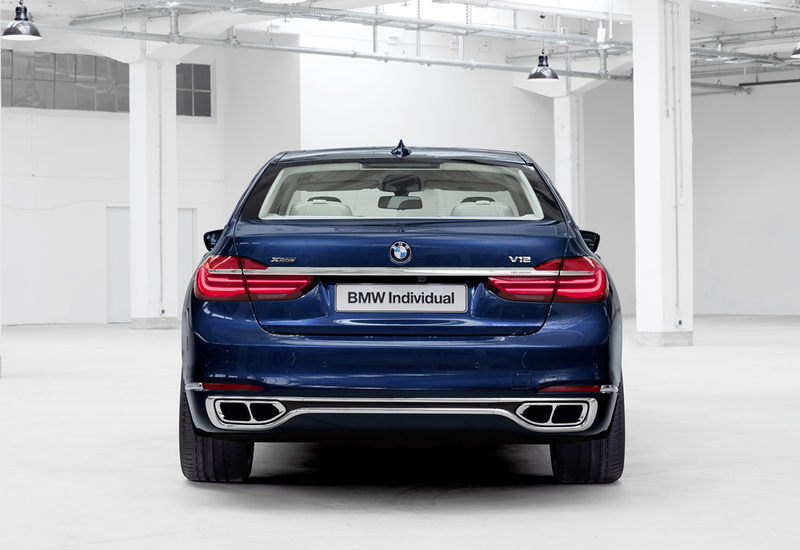 The BMW Individual M760Li xDrive V12 THE NEXT 100 Years is available to order now, POA.